Dr. Max Goldstein is a board-certified family physician. 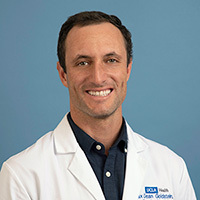 He was born and raised in Santa Monica, completed his medical degree at UCLA and completed his residency at UCLA School of Medicine. Dr. Goldstein has lived and worked abroad in such places as Yemen, Venezuela, Spain, South Africa and France. His medical practice includes care of the whole family, from newborns to the elderly, and he specializes in preventive health, family planning, contraceptive management, LGBT health and sports medicine. Dr. Goldstein also has a deep sense of commitment to healthcare for all and continues to provide medical care to rural farming communities in California. Outside of medicine, he loves ocean swimming, bodysurfing, yoga and making art.